Fruity PEBBLES™. The Fruity way to rock. Fruity PEBBLES™ cereal is a sweetened crispy rice cereal with intense fruity flavor. 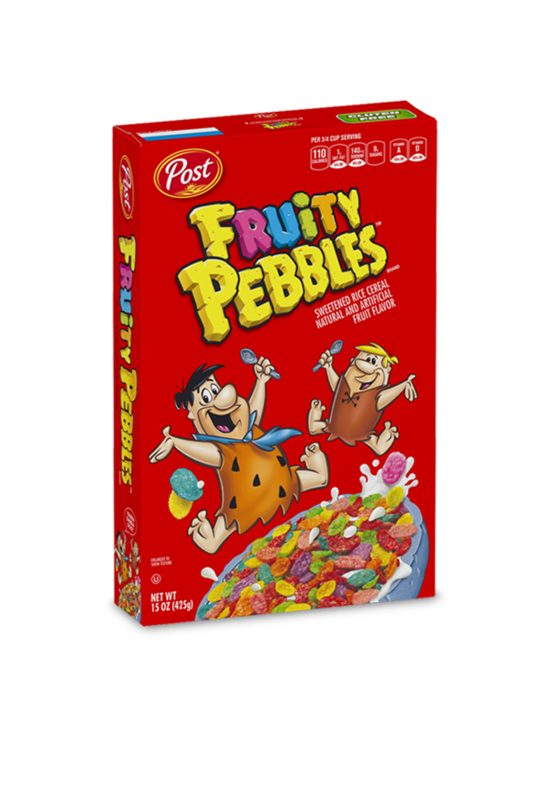 Fruity PEBBLES™cereal, with its delicious taste has been a family favorite for over 40 years! BLUE 2, BHA (TO HELP PROTECT FLAVOR). SODIUM ASCORBATE (SOURCE OF VITAMIN C), ASCORBIC ACID (VITAMIN C), NIACINAMIDE, REDUCED IRON, ZINC OXIDE (SOURCE OF ZINC), VITAMIN B6, VITAMIN A PALMITATE, RIBOFLAVIN (VITAMIN B2), THIAMIN MONONITRATE (VITAMIN B1), FOLIC ACID, VITAMIN B12, VITAMIN D3.